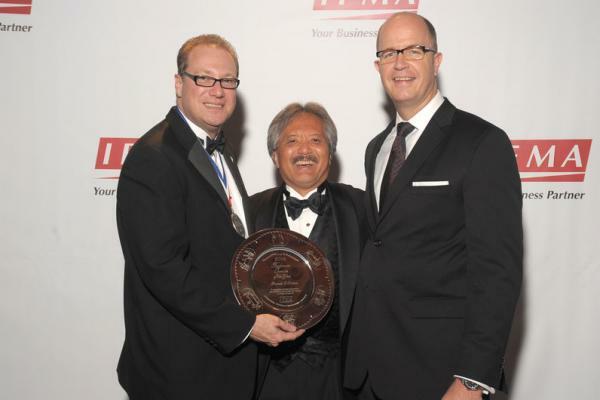 Frank Weber, vice president of food and beverage for Royal Caribbean International, has been recognized with the International Foodservice Manufacturers Association (IFMA) Silver Plate Award in the Hotel and Lodging category. IFMA recognizes excellence and outstanding innovative talents in nine segments of foodservice operations. This year marks the 58th Annual Gold and Silver Plate Awards created by IFMA, and the first time a cruise line executive was recognized. All past winners of the IFMA Gold and Silver Plate Awards are members of the International Gold and Silver Plate Society, a group that is dedicated to the advancement of the foodservice industry. Photo: (from left) Frank Weber, vice president of food and beverage, Royal Caribbean; Loren Kimura, president and CEO, Basic American Foods; and Ken Taylor, director, food and beverage fleet restaurant operations, Royal Caribbean.